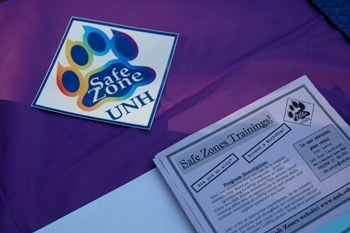 UNH Safe Zones is an educational program to raise awareness of Lesbian, Gay, Bisexual, Transgender, Queer, Questioning, Intersex, Asexual, Aromantic, Pansexual, and other (LGBTQIAP+) issues and contribute to a campus climate of inclusion at UNH. This is achieved through the implementation of our many programs and trainings geared towards various intersecting topics. Our goal is to prepare members of the UNH community to support LGBTQIAP+ faculty, students, and staff and take active steps toward reducing and preventing harassment, discrimination, and violence based on sexual orientation, romantic orientation, and gender identity or expression. UNH Safe Zones is an intersectional organization and seeks to do the same in regards to race, ethnicity, nationality, religion, ability, weight, socio-economic status, age, and more. To schedule UNH Safe Zones program or training, please click here to access our online request forms. We ask that if you use any materials that you credit the UNH Safe Zones program or the original source as noted.